Bathrooms are one of the costliest rooms in your home to remodel, and most people have more than one, compounding the problem. The expense often comes from labor costs for things that go beyond your average DIY skills. 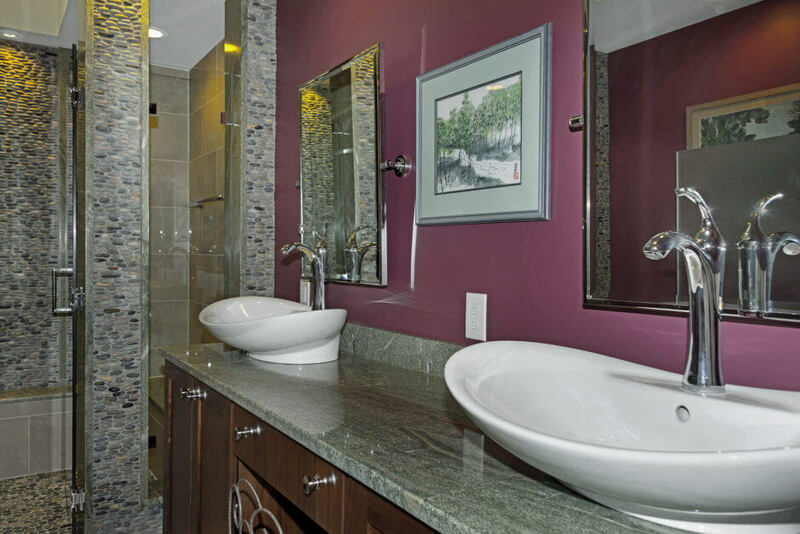 If you don’t have the money or the time for a full bathroom remodel, small changes can make your bathroom a much more luxurious and functional space. This is especially true if you are willing to put in a little bit of the work yourself. Here are some great budget update ideas to get you thinking. Hands-down, paint gives you the biggest bang for your remodeling buck. It’s cheap, but makes a huge impact, especially if you choose the right colors. Plus, since bathrooms are usually small, it won’t take you a lot of time or effort to do it. Be sure to use a mildew- or moisture-resistant primer before topping the walls with paint. While we’re talking about paint, think about refreshing your cabinets by giving them a couple of coats, as well. Clean them, sand them, and then prime them before topping with a couple of coats of oil-based paint. Your tired old cabinetry will look new again with very little time or money. Outdated light fixtures are an inexpensive thing to replace, but doing so can really change the entire feel of your bathroom. If you like your fixtures but don’t like the color or the finish, spray paint them, which is even cheaper than replacing them. Also, be sure that you have enough light—nothing makes a bathroom look more dingy than poor lighting. It’s also very inexpensive to replace outdated handles, pulls, and doorknobs on your cabinetry. A brushed nickel or an oil-rubbed bronze looks chic and modern. If your cabinets don’t have any hardware, get a drill and add some holes so you can put your own on. If you have a plain plate-glass mirror, think about putting a frame around it. Get some molding from your home improvement store, cut it to fit, paint it, and adhere it to the mirror with epoxy or marine glue. You can fill in the corners with wood filler, some sandpaper, and touch-up paint. Go here for a quick tutorial. This easy frame will give your bathroom a high-end look without the cost of an expensive mirror. Bathroom floors can be really disgusting. Cracked linoleum, anyone? And even though replacing your flooring sounds like an intimidating project for the average DIY-er, there are several ways to do it simply and cheaply. Wood laminate or groutable luxury vinyl tile can usually be installed over your existing floor (as long as it’s in decent shape), even if you don’t have any experience installing tile. Here’s a tutorial for laminate and here’s a tutorial for vinyl tile.